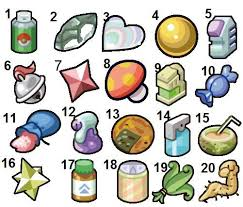 As in all Pokemon Games, a player can find various Miscellaneous Items during their second journey through The Alola Region. Most of these items have no other use besides being sold for some extra Money, while a few have a specific purpose. There are even some that cannot be found in the game but are still found in the game's coding. Ability Capsule: A capsule that allows a Pokémon with two Abilities to switch between these Abilities when it is used. Adrenaline Orb: Using it makes wild Pokémon more likely to call for help. If held by a Pokémon, it boosts Speed when intimidated. It can be used only once. Amaze Mulch: A fertilizer for growing Berries. However, it appears to be unsuitable for the soil in the Hoenn region and has no effect. BalmMushroom: A rare mushroom that gives off a nice fragrance. It can be sold at a high price to shops. Big Mushroom: A very large and rare mushroom. It’s popular with a certain class of collectors and sought out by them. Big Nugget: A big nugget of pure gold that gives off a lustrous gleam. It can be sold at a high price to shops. Big Pearl: A rather large pearl that has a very nice silvery sheen. It can be sold to shops for a high price. Black Flute: A flute made from black glass. It makes it easier to encounter strong Pokémon in the place you use it. Blue Flute: A flute made from blue glass that awakens sleeping Pokémon. Blue Shard: A small blue shard. It appears to be a fragment of some sort of implement made long ago. Boost Mulch: A fertilizer for growing Berries. However, it appears to be unsuitable for the soil in the Hoenn region and has no effect. Bottle Cap: A beautiful bottle cap that gives off a silver gleam. Some people are happy to receive one. Comet Shard: A shard that fell to the ground when a comet approached. It can be sold at a high price to shops. Common Stone: A perfectly normal stone that might appear to be valuable to some. It’s all in the eye of the beholder. Damp Mulch: A fertilizer for growing Berries. However, it appears to be unsuitable for the soil in the Hoenn region and has no effect. Escape Rope: A long and durable rope. Use it to escape instantly from a cave or a dungeon. Festival Ticket: A ticket that allows you to host a mission in Festival Plaza. Fluffy Tail: A toy that attracts the attention of a Pokémon. It guarantees escape from any battle with wild Pokémon. Gold Bottle Cap: A beautiful bottle cap that gives off a golden gleam. Some people are happy to receive one. Gooey Mulch: A fertilizer for growing Berries. However, it appears to be unsuitable for the soil in the Hoenn region and has no effect. Locations: No Location Green Shard: A small green shard. It appears to be a fragment of some sort of implement made long ago. Growth Mulch: A fertilizer for growing Berries. However, it appears to be unsuitable for the soil in the Hoenn region and has no effect. Heart Scale: A pretty, heart-shaped scale that is extremely rare. Some people are happy to receive one. Honey: A sweet honey with a lush aroma that attracts wild Pokémon when it is used in tall grass, in caves, or on special trees. Max Repel: An item that prevents any low-level wild Pokémon from jumping out at you for a while. It lasts longer than Super Repel. Nugget: A nugget of the purest gold that gives off a lustrous gleam in direct light. It can be sold at a high price to shops. Odd Keystone: A vital item that is needed to keep a stone tower from collapsing. Voices can be heard from it occasionally. Pearl: A rather small pearl that has a very nice silvery sheen to it. It can be sold cheaply to shops. Pearl String: Very large pearls that sparkle in a pretty silver color. They can be sold at a high price to shops. Pink Nectar: The flower nectar obtained at the flowering shrubs on Royal Avenue. It changes the form of certain species of Pokémon. Poké Doll: A doll that attracts the attention of a Pokémon. It guarantees escape from any battle with wild Pokémon. Poké Toy: A toy that attracts the attention of a Pokémon. It guarantees escape from any battle with wild Pokémon. Pretty Wing: Though this feather is beautiful, it’s just a regular feather and has no effect on Pokémon. Purple Nectar: A flower nectar obtained at Poni Meadow. It changes the form of certain species of Pokémon. Rare Bone: A rare bone that is extremely valuable for the study of Pokémon archeology. It can be sold for a high price to shops. Red Flute: A flute made from red glass that snaps Pokémon out of infatuation. Red Nectar: A flower nectar obtained at Ula’ula Meadow. It changes the form of certain species of Pokémon. Red Shard: A small red shard. It appears to be a fragment of some sort of implement made long ago. Repel: An item that prevents any low-level wild Pokémon from jumping out at you for a while. Rich Mulch: A fertilizer for growing Berries. However, it appears to be unsuitable for the soil in the Hoenn region and has no effect. Roto Bargain: One of the Rotom Powers. It reduces the prices of products at Poké Marts by half. Locations: Roto Loto Roto Catch: One of the Rotom Powers. It increases the chance to catch Pokémon a lot. Roto Encounter: One of the Rotom Powers. It increases the chance of encountering high-level wild Pokémon a lot for a certain period of time. Roto Exp. Points: One of the Rotom Powers. It increases the Exp. Points your Pokémon receive after battle a little. Roto Friendship: One of the Rotom Powers. It helps Pokémon in your party grow friendly faster. Roto Hatch: One of the Rotom Powers. It helps Eggs hatch faster. Roto Prize Money: One of the Rotom Powers. It triples the prize money you receive after battle. Roto Stealth: One of the Rotom Powers. It prevents you from encountering wild Pokémon for a certain period of time. Shoal Salt: Salt that you found inside Shoal Cave. Shoal Shell: A seashell that you found inside Shoal Cave. Stable Mulch: A fertilizer for growing Berries. However, it appears to be unsuitable for the soil in the Hoenn region and has no effect. Star Piece: A small shard of a beautiful gem that demonstrates a distinctly red sparkle. It can be sold at a high price to shops. Stardust: Lovely red sand that flows between the fingers with a loose, silky feel. It can be sold at a low price to shops. Strange Souvenir: An ornament depicting a mysterious Pokémon that has been venerated as a guardian deity for an extremely long time in The Alola Region. Super Repel: An item that prevents any low-level wild Pokémon from jumping out at you for a while. It lasts longer than Repel. Surprise Mulch: A fertilizer for growing Berries. However, it appears to be unsuitable for the soil in the Hoenn region and has no effect. TinyMushroom: A very small and rare mushroom. It’s popular with a certain class of collectors and sought out by them. White Flute: A flute made from white glass. It makes it easier to encounter weak Pokémon in the place you use it. Yellow Flute: A flute made from yellow glass that snaps Pokémon out of confusion. Yellow Nectar: A flower nectar obtained at Melemele Meadow. It changes the form of certain species of Pokémon. Yellow Shard: A small yellow shard. It appears to be a fragment of some sort of implement made long ago.